The colour is jonquiripe corn and the texture shows a sticky ring at the top of the glass that very, very late builds some fat tears without legs (a truly great oiliness indeed!). The nose offers the typical young Caol Ila notes with a strong peaty-herbal touch (from the European oak casks, I guess). Straightforward, honest and quite impressive (but nothing special). The whisky arrives warming and not hot at all (despite 58.2% abv) on the palate and immediately coats the whole of the mouth (yes, the terrific oiliness translates into a great mouthfeel, usually). There is a minor astringent moment from heavy tannins (the "rejuvenated" casks work almost like virgin oak) but this is not too distracting. 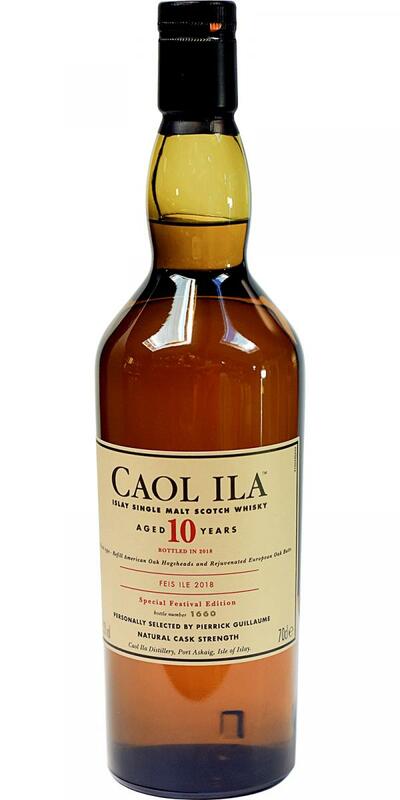 The taste itself is exactly what one would expect from a 10-years old Caol Ila: Bold flavours of maritime peat and vanilla with some fruits, spices, herbs and more. Again nothing special, simply "you get what you expect" (in a consistent high quality). The finish is very long (as could be expected from the excellent oiliness, too) and great to chew - it releases more spices and sugars that way. Water turns this dram more quaffable but it takes away that nice kick the high abv provides to my taste buds. Actually I like it both neat and reduced to about 46% abv. Yes, great. Great Feis Ile - filling of Caol Ila. The nose conjures up a smile directly on the lips. Full broadside phenolic smoke. And on the subject broadside: clearly maritime notes with salt, spicy and sun-dried seaweed, chain fat, smell of mud. Bright and fresh fruits resonate. No trace of alcohol. Medium to long, pleasantly dry, still very smoky, a hint of lemon, a little baked apple and crushed banana. Unmistakably Caol Ila. Very powerful and intense maritime scents come from the glass - seaweed on the beach, spray, damp dew. The smoke is also present, with a clear herbal impact. I still find dried red fruits behind the scenes. Steroids. Intense maritime, citrus, a hint of Granny Smith apple. A hint of red fruits is found after some time in the mouth, mixed with a few herbs and a hint of tobacco leaves. Everything is surrounded by beautiful vanilla sweetness.